We're in the midst of a multi-year stretch of strong relative performance for US large cap stocks compared to most other asset classes. These results are the same whether we're looking at the S&P 500, Dow Jones Industrial Average, or Total Stock Market Index as our large cap bogey, all are similarly dominated by a handful of big, growth-oriented companies. We include these companies in our portfolios as one of five or six "core" asset classes, but our expectations for large cap stocks are always modest in comparison to smaller and more value-oriented shares. So it's always a bit of surprise when we see them outperforming everything else. A surprise, but not totally unexpected. 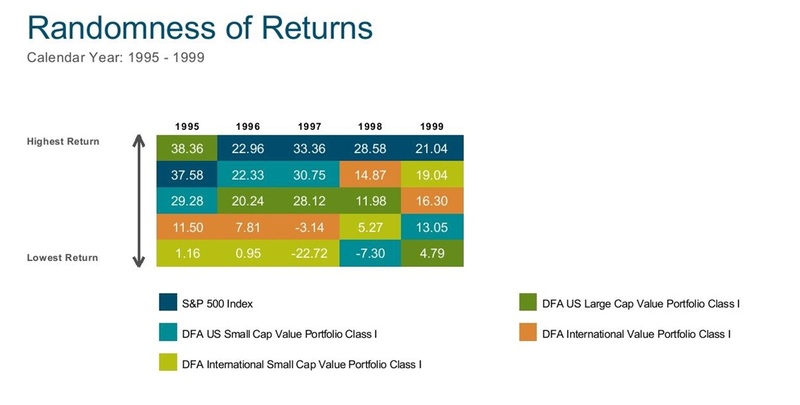 To see why, let's start with a table of relative stock asset class returns from 1995 to 1999. The S&P 500 finished first in four straight years and finished second out of five in the other year. Over these five years, the S&P 500 compounded at 28.6% per year ($1 grew to $3.51), while all other asset classes were far behind. US large and small value stocks returned +20.1% and +16.7% a year ($1 grew to $2.50 and $2.17, respectively). International large and small value stocks fared even worse -- the former earned just +9.2%, and the latter actually lost -0.2% per year ($1 resulted in $1.56 and $0.99, respectively). The vast majority of investors responded to this anomalous result by piling into US large cap stocks and abandoning sensible diversification. And they were severely punished for performance chasing and market timing over the next 11 years. The table below picks up where the first one left off and looks at relative asset class returns from 2000 to 2010. In nine of the ensuing eleven years, the S&P 500 finished last or next to last. What's worse, over the entire 11-year stretch, the S&P 500 returned almost nothing, earning just +0.4% per year ($1 grew to $1.05). But this wasn't a bad stretch for all stocks, just US large cap growth companies. 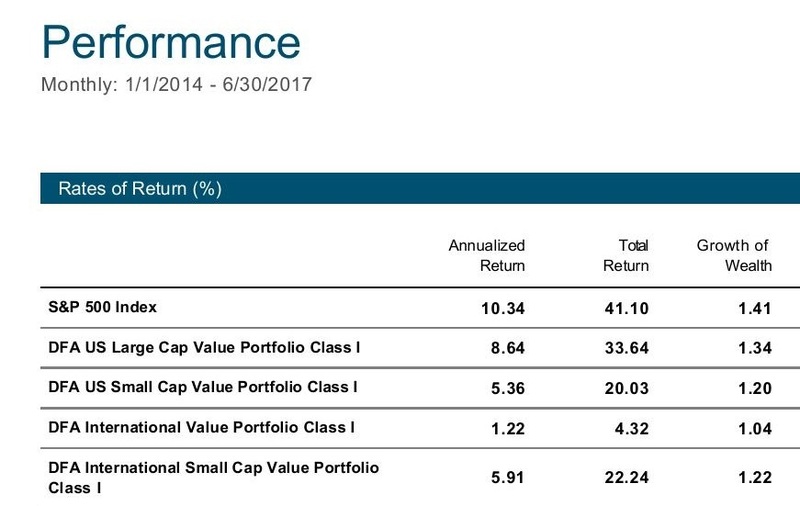 US large and small value stocks returned +5.7% and +11.0% per year ($1 grew to $1.85 and $3.14, respectively). International large and small value stocks, which performed the worst during the 95-99 stretch, had the best results -- +7.0% and +11.9% annually ($1 grew to $2.11 and $3.44, respectively). This is not to say that history will repeat and that we'll be in for a decade-long stretch of no returns on the S&P 500. It does remind us, however, that piling into the "hot" asset class at any given time is generally a mistake, as short-term asset class returns are random and anything that does exceedingly well for a stretch can underperform for an equally long period. A better approach is to stick with a diversified portfolio and rebalance periodically, away from what's been outperforming and into what's been underperforming. "People often ask the question, 'How long do I have to wait for an investment strategy to pay off? '...And my answer is it's at least one year longer than you're willing to give." Successful investing takes patience as much as anything, and quite often more patience than you're willing to commit. But as we've seen from historical results, going that extra mile is usually worth your while. 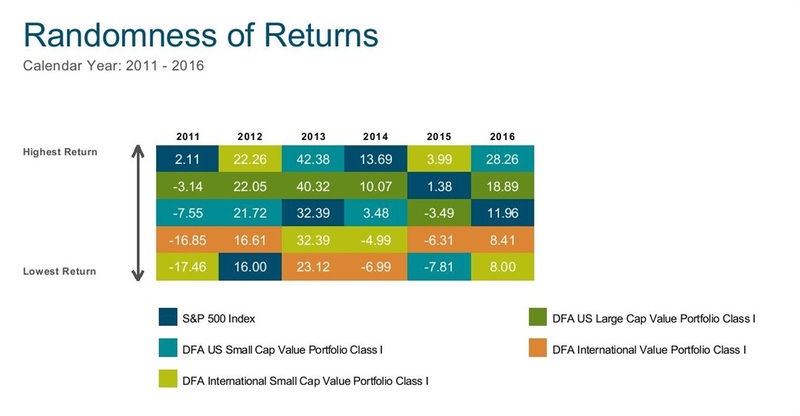 Here is a table showing annual asset class returns since 2011. The S&P 500 (+13.0%) and US large value (+13.0%) are tied for the top spot, with US small value (+10.6%) noticeably behind and international large and small value stocks (+3.4% and +7.8%) bringing up the rear. And here are the annualized returns for each asset class since 2014 -- only the S&P 500 has reached a double-digit gain.